Irish Go Congress: On February 6 to 8, the Irish Go Congress took place in Gresham Hotel, Dublin. For the first time, it featured a Chinese Chess tournament alongside the traditional Confucius Cup (Irish Open) and Irish Rapid Play. 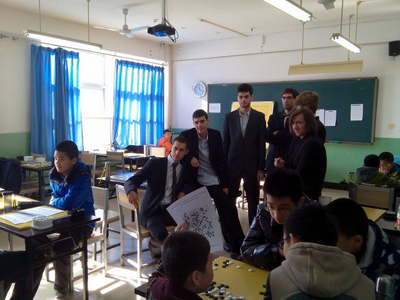 Chinese guests from the Go and Chinese Chess organisations attended, including 7p Go professionals Hua Xueming and Huang Yizhong. The winner of the main event, the Confucius Cup, was Kim Young-Sam, and the Friday night Irish Rapid was won by Oh Chi-Min 7d. Alistair Wall Wins Largest Cheshire Tournament: Alistair Wall 2d beat the previous winner, Mark Elliot (1d Manchester), in the last round of the Cheshire Tournament, thus winning first place. Tony Pitchford and Tony Atkins organized the event. 34 people attended in total. Russia: The Chinese Consulate General Cup finished on February 2 in Sankt-Peterburg with Zhen Wang 7d in first, Jung-hyeop Kim 7d in second, and Ilja Shikshin 7d in third. Ireland: Also on February 8, Young-Sam Kim 7d bested Chi-Min Oh 7d at the 2015 Irish Confucius Cup Go Tournament in Gresham while Cristian Pop 7d placed third. Czech Republic: Adriana Tomsu 3k (left) took the Czech Youth Go Championship in Praha. Behind her were Samuel Havelka 3k in second and Tereza Salajkova 10k in third. The European Go Cultural Centre (EGCC) and the Dutch Go Association will host the 2015 European Youth Go Championship on March 12 through March 15 in Zandvoort, Netherlands. It will be split into three categories: under 12, under 16, and under 20 age. Each group can qualify for either the World Youth Go Championship (under 12, under 16) or the Globis Cup in Japan (under 20). Nikon will sponsor prizes including a quality camera for the top player in each group. To register or for more information including rules, a full schedule, and accommodations, please visit the EYGC 2015 official website. 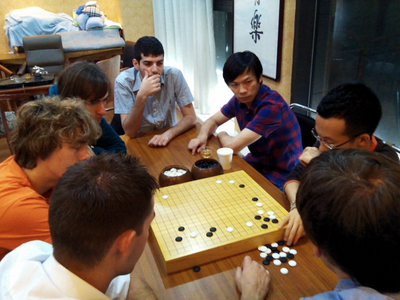 Six top European players are currently studying in Beijing, China under a program sponsored by CEGO China. The Chinese Go magazine Qi-Shi recently published an interview with five of the players: Pavol Lisy (Slovakia), Ali Jabarin (Israel), Lukas Podpera (Czech Republic), Jan Simara (Czech Republic), Dusan Mitic (Serbia). Andrii Kravets of the Ukraine was not available. Lisy and Jabarin are two new European pros. The report was translated by Jennie Shen and Kevin Huang and edited by Chris Garlock. Qi-Shi: What’s the status of go in your countries? Podpera: There are about 250 active go players in Czechia, and their level is getting stronger and stronger. Last year, for example, the Czech team won the European team championship. There are four European 6ds in Czechia; we (Lucas and Jan) are two of them. Lisy: I’m from Slovakia. There are about 50 active players there, including eight dan players. Jabarin: Israel has about 50 players. I feel like the talent level is pretty high, because even though some countries have more players, we can beat them. We have some promising young players. Qi-Shi: How long have you been playing go? What’s your background? Podpera: I started to play go at the age of 7. My father introduced me to the game because he used to play the game in the university. 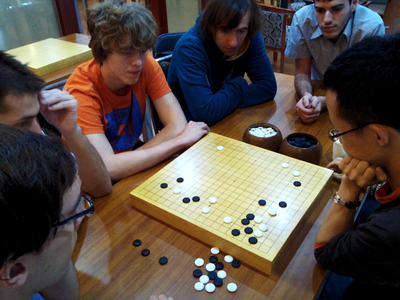 Simara: I started [to play go] because I played chess, then I met go. When I was about fifteen, I switched from chess to go. Qi-Shi: Why is go more interesting to you? Simara: Go has much more possibilities. Mitic: It’s the same as with Lukas — I learned go from my father. 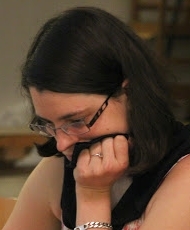 Lisy: I started to play go at the age of five. My father taught me. Ali: I got introduced to the game by a friend. I just started to play when I was twelve, started going to the tournaments, then kept playing since then. Qi-Shi: You came to Bejing to study at the Ge’s Academy. What did you learn here? Do you have a goal? Podpera: The European pro qualification which I would like to try to pass. Otherwise I don’t have any real future planning; let’s see how it will go. Simara: I think I’m improving in all areas. Lisy: I feel like I’m improving in the school because I spend lots of time on go. I improved mostly at the endgame I think. Qi-Shi: Do you have a plan for your future? Do you want to be a pro or want to do things related to go? Podpera: Of course I would like to be a pro. Simara: About the future, not exactly sure…come back and see, play some games..
Mitic: I have no plans for the future, except I’ll try to become pro. Lisy: My plan for the future: to get good results at the international tournaments, win some games against Asian pros, but that’s just a dream. Jabarin: I was in university and I stopped before I came here, and I told myself I that for at least two or three years, let’s see what I can do with go. The dream is to be able to play competitively in Asia. It’s not a plan; I would say it’s a dream, but that’s the end goal. I hope I can improve as well, I know it’s not very easy. Qi-Shi: What do you think is the most interesting thing about go? Podpera: The endless numbers of variations. Qi-Shi: Which part of go is the most difficult to improve? Podpera: For me the most difficult thing to improve is the endgame. It’s very hard to count the points exactly, most of the games are decided by the endgame. But here they found how to improve in those go schools with practice. Simara: The most difficult part to improve I think is reading. Mitic: I agree with most of the things Jan said, I think the most difficult part of go is reading. Lisy: The most difficult part of go, maybe the judgement, I don’t know. Jabarin: I think something which is very important is mentality. When you play and also when you study. Having the will to win, the will to try hard, so you’ll study a lot, staying calm while playing is very important, that’s one of the things that I’m trying to improve here. Other than that, I feel like I gained a little bit of knowledge also. I always learn new moves, not just josekis, but new techniques. Then something which I learned about the game, I can just say that to me go is very deep, just feels different from all the other games. It’s not just a game. Qi-Shi: Who is your go idol? 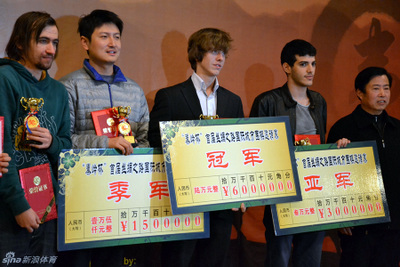 The six players played the Silk Road Amateur Tournament in Xian, China (left). Lisy won first place and Jabarin won second place. Qi-Shi: How did you feel after you won the tournament? Lisy: I was very happy. The tournament was very good. I enjoyed it, I think, For example the time setting helped me, because I’m used to playing fast games. It was not so difficult to overcome the pressure. Jabarin: We (Pavol and Ali) just came back from Japan from a tournament, (where) we had decent results. For me, I was feeling a bit more confident. And I was quite proud of some of the games I played in the [Silk Road] tournament. I regret the game I lost to Pavol. The tournament was a lot of fun, so it was good, of course I was happy with the prize money. Qi-Shi: People think westerners and Asians think differently. Do you think that western go players and Asian go players think differently? Pavol: I don’t know how they think. I think there’s a difference that they care more about the beginning of the game, they know how to finish the game, that’s the difference. Qi-Shi: Some Asian pros think the feeling/instinct is very important. Do you play more with your feeling/instinct or reading and judgement? Ali: Both. I think I understand what he means. The feeling is somehow much more important. Sometimes we play much less territorial, play more for a moyo, maybe not myself, but I think many players in Europe, they play much more moyo style. Sometimes t’s just like ‚Oh wow, this move looks good, feels good,“ not saying it like it is much more precise. Qi-Shi: What do you want to do for European Go? Podpera: We can bring some knowledge from China to Europe, open go schools and teach. Simara: We are all part of the [pro] system. So if some of us are successful, naturally this system is also successful, that’ll be good for everyone. photos: top right: the Go school in Beijing; 2nd left/3rd right: pro lesson with WangYao 6P; bottom left: Silk Road (also called 1st Qinling Mountains Cup) amateur tournament awards, Pavol won first place, the prize money was 60,000 RM, (US$10,000). Ukraine: Svitlana Tarasenko 5k took the Open Championship of Rivine on January 31 while Yaroslav Malko 8k placed second; Andrii Pylypchuk 3k came in third. France: Manuel Frangi 1d bested Guillaume Attia 3d at the 19th Orsay tournament on January 25 while Mathieu Daguenet 3d placed third. Turkey: The 1st Istanbul City Handicap Go Championship Finals finished on January 31 with Ertug Akkol 1d (left) in first, Dogac Kose 1d in second, and Hande Olgar 14k in third. Maidenhead-Hitachi Tournament: On January 24th, Charles Hibbert 2 dan went on to win all three of his games, claiming the Maidenhead title. Coincidentally, it was also his first-ever tournament. Second and third place were claimed by Alistair Wall and Jitka Bartova. All players winning three or two games received a prize. 55 players took part in the event. Pandanet Go European Team Championship: On January 13th, the UK secured a win against the South African team with a score of 3 wins to 1 loss, making it their fifth win in the league. A commentary by Andrew Simons of his own game against Victor Chow 7d can be found in the news article on the BGA website. The UK team currently ranks second to Bulgaria in their league. The two teams will play on February 24th. Sweden: The Jusandan 2015 finished on January 18 in Stockholm with Yaqi Fu 6d (left) in first, Charlie Aakerblom 4d in second, and Fredrik Blowback 6d in third. Czech Republic: Also on January 18, Martin Jurek 5d took the 5th Decin Open Tournament. Behind him were Ondrej Kachyna 2d in second and Tadeas Berkman 1k in third. Turkey: Ertug Akkol 1d bested Mustafa Morca 2k at the 2nd Istanbul City Championship Finals on January 17 while Barkin Celebican 2k placed third.